SNET offers satellite SNG truck and live IP streaming from Tokyo, Japan. Tokyo, April 2016: SNET offers clients the most advanced video technology for the production and transmission of news and sports reports. New to promoting its services on TVZ, SNET is one of the core companies of the SKY Perfect JSAT Group, Asia's largest pay TV platform and satellite operator. It owns three SNG satellite trucks and two fixed earth stations. 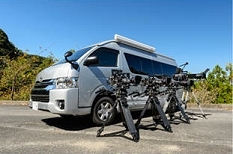 As well as supplying 4K video production and recording facilities, the company also offers HD/SD uplink and downlink satellite services from all over Japan, TV live broadcast studios and live IP streaming services. English-speaking ENG camera crews can also be supplied. More information about the services SNET offers in Japan.